Scandinavian instrumental, singing and dance workshops, featuring top level musicians from Denmark, Sweden, Finland and Norway will take place on June 10, 2011 in and around Nisswa, Mn. 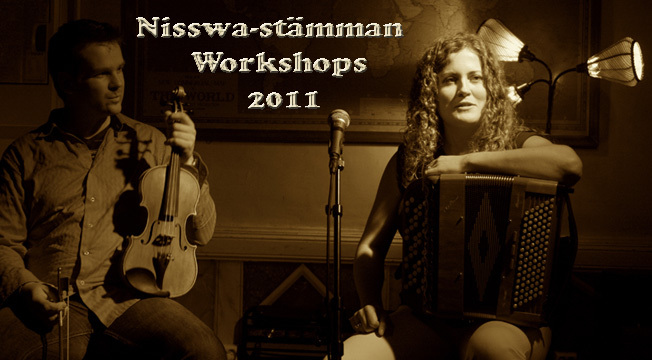 These workshops are offered in conjunction with Nisswa-stämman Scandinavian Folkmusic Festival, June 10, 11, 2011. Sessions generally start at 10 a.m. and continue until 3 p.m., with a lunch break in the middle. There are some sessions that are half day only....check the listings. All workshops are generally taught by ear and participants are encouraged to bring recording devices. Cost for the sessions is $20 per each 2 hour session, or $35 for two sessions if they are from the same teacher. The 'musician's lunch' at most workshops happens at noon, and consists of cold cuts, vegies, fruit, etc and cost an extra $5. (note - no lunch provided at the dance workshops...but downtown Nisswa is right there with several restaurants available) After you signup you will receive more information about your workshop, including a detailed map for getting there. Click HERE to download a pdf file of these descriptions. 10 am to 3 pm – Finnish fiddle music from 18th century till today with Arto Järvelä . . . Grandpa Johannes bought Arto his first fiddle from the Kaustinen hardware store when he was 4. He grew up in the Järvelä (village in Kaustinen) music tradition and that's the cornerstone of his traditional fiddle repertoire. There are Järvelä fiddlers at least 7 generations before Arto so he is happily afflicted with the “fiddlin' disease”. He started his formal studies at Sibelius Academy 1983 and there he explored even more interesting Finnish fiddle styles, both living and historical. As one of the Finland's most talented folk musicians Arto has been representing Finnish culture in more than 30 countries. Concert appearances have taken him as far afield as Cuba, Peru, Australia, Pakistan, Thailand, USA and most of Europe. Teaching in Sibelius Academy's Folk Music Department has been one of his major duties since 1988. His older bands JPP, Ampron Prunni, Pinnin Pojat and The Helsinki mandoliners are still alive and kicking, along with numerous other new constellations including Maria Kalaniemi's bands. And of course Arto is working with new and interesting solo projects and swimming in ice holes in winter, just for fun. 1 pm to 3 pm – Hardanger Fiddling with Britt Pernille Frøholm . . . Britt is from Hornindal in the county of Sogn & Fjordane on the west coast of Norway, and the traditional music from this area is her musical fundament. A fiddler since the age of nine, she took her formal education at the Ole Bull Academy and the Rauland Academy, where she earned a MA degree in Traditional Arts. In addition to this solid musical education, Britt was born into a family that has nurtured traditional music and is responsible for bringing many musicians into the world. She is currently living in Oslo working as a freelance musician, performing in many groups and constellations ranging from traditional folk music to free improvisation with jazz musicians. Her hardingfele workshop will focus on tunes from the west coast of Norway, and it will be possible to learn springar, halling, reinlender, polka and waltz. The tunes will be taught by ear, but notes can be provided if necessary. 10 am to 3 pm - Swedish Nyckelharpa with Torbjörn Näsbom . . . I grew up immersed in music. Two older brothers who played and who later became professional musicians, and my father, music teacher Lars Näsbom. Mother, luckily, was ‘normal’ and kept the family on track. I started playing fiddle at the age of seven, and would visit such luminaries as Viksta-Lasse and Eric Sahlström, who became my great teachers of spelmanslåtar. I will teach from the tradition of those two great men. In 1984, I started to play nyckelharpa, first under controlled conditions but then less and less so, so nowadays my use of the nyckelharpa can be considered ‘provocative.’ I will try to teach how to get the real polska feeling when playing nyckelharpa. I will teach tunes mainly from Uppland. I also love to teach nyckelharpa technique that really improves the capacity to play well. ...We tried this last year and it worked so well, we are doing it again and expanding it! These workshops are open to all instruments and will cost $20 for a half day and $40 for a day long session. There are three workshops, but only two locations. I know, it’s confusing.. stay with me here.. Location A: 10 am to 3 pm - Modern tunes in traditional Scandinavian styles with Bruce Sagan & lydia ievins . . . It is a healthy sign that contemporary Scandinavian musicians are composing tunes in traditional styles. Sometimes these melodies also show influences from jazz or other genres. And modern bands incorporate a broad range of instruments from the ubiquitous fiddle to bouzouki, berimbau, and tenor sax. Bruce Sagan and lydia ievins will lead this workshop, sharing some of the coolest tunes they know by living musicians from Sweden, Norway, and the US. Come and learn a swinging schottis or a roaring Rørospols! All instruments are welcome. Participants should be proficient on their instrument. 1 pm to 3 pm - Mette & Kristian teach you their favorite tunes from Denmark. . . Mette Jensen (accordion) and Kristian Bugge (fiddle). We play some favorites from Denmark. The tunes are from different places and we talk a little about why they sound the way they do and how to play them. Every instrument is most welcome! You will learn the tunes by ear, but if you prefer notes you can get them, while learning by ear. 10 am to Noon – Svensk Snapsvisor (drinking songs) with Elise Peters . . . Svensk snapsvisor are a traditional part of the Swedish culture. Join Elise Peters as she shares some familiar and less familiar snapsvisor that she has learned on her many trips to Sweden. No previous singing experience necessary. Participants are encouraged to bring recording devices. Some handouts will be available. Elise Peters has throughout her life travelled to Sweden. As a college student and as an adult, she has attended many parties and gained a repertoire of fun songs that add to the party atmosphere. In addition to singing, Elise enjoys folkmusik through nyckelharpa and fiddle playing as well as dancing. 1 pm to 3 pm (or whenever it's over) - Vis Stuga, coordinated/led by Ross Sutter . . . Singers who have learned tunes from previous workshop teachers in the area, including Maria Röjås, Cajsa Ekstav, Josefina Östling and others, let's gather and refresh some of these tunes and then brush one or two up for a performance for the Friday evening concert, and possibly during Ross Sutter's set on Saturday during the stämma. If you haven't taken any of these previous workshops, you are still welcome to participate. No charge for this session, just bring your voices and your enthusiasm. But, please sign up anyway so we have an idea of how many might come. We have tons of dance workshops this year. TELL YOUR FRIENDS! The workshops will take place in two locations this year: at the Nisswa American Legion and in the Dance Barn at the Nisswa Pioneer Village. No lunches are available with the dance workshops....you can eat in Nisswa at the Legion (great lunches!) or several other restaurants. Participants are encouraged to have smooth soled shoes and some previous dance experience. You do NOT need to bring a partner! 10 am to 12 noon - Danish couple dances with Mette & Kristian . . The duo is experienced in teaching dance lessons as well as playing for them. You will learn the basic steps (we also have the "grand father" edition and we promise everyone can learn that :-) ) polka, waltz and hopsa. You will get to use these steps in some of our favorite figure dances. They are not that difficult but we promise they are good for all kinds of parties. And of course we always teach at the skill level of the people who show up. Welcome! 1 pm to 3 pm - Norwegian couple dances with Linda Gytri . . . This workshop will be all about Norwegian traditional Gammaldans (old time couple dance) - open for everybody, both beginners and experienced dancers. We will start with Reinlender with different variations, and also try the traditional Polka - also with variations. We will focus on finding the good rhythm and groove in the dance - and having fun dancing! People can sign up both in pairs and single - and we`ll mix during the workshop. I have experience with teaching dance to both children and adults here in Norway. 10 am to noon - Finnish Tango, Humppa, Maasurkka, and Polkka with Ralph Tuttila & Patsy Larkin . . . this workshop is open to all, no experience necessary. Bring a partner if you have one, or come alone, we will find everyone a partner! Ralph Tuttila has been dancing Finnish Tango for many, many years and is eager to spread his love for Finnish ballroom and couple dances around the world! 1 pm to 3 pm - Swedish dance: "The secrets of dancing Bodapolska" . . . Our swedish instructors will teach how to dance Bodapolska in the way the dance for many years was formed and developed by the great fiddler and skilled dancer Röjås Jonas together with his wife and friends in Boda in Dalarna. And this is the way that the very popular Bodapolska is still danced in a living tradition in Sweden today. Their method of teaching focuses on the natural connection between the music and the dance and they work together with the dancers to find the balance when body, technique, movement and music harmonize and becomes a nice dance together with the dance partner in a very natural way! This dance workshop is also suitable for the fiddlers as it brings a better understanding about the dance and how to play for dance. Some previous dance experience is helpful.